We believe it is our duty and responsibility to inform you our customers of the issues that can arise from choosing the incorrect material and or coating for the corrosion protection of your particular product. As a standard, we apply a single coat of powder which is suitable for indoor use only and carries a 24-month warranty. This warranty covers that the process of pretreatment and cure of powder coated products meets or exceeds the industry standard. 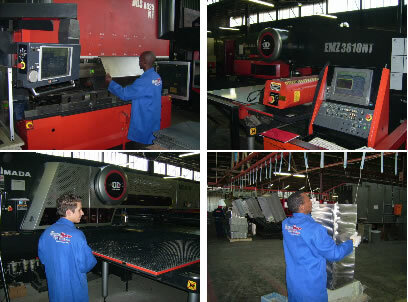 Boomgate Systems warrants against cracking, peeling or excessive fading due to normal wear and tear, damage caused by mechanical abuse such as scratches, rough handling, installation or vandalism is not covered by this warranty. Change the base material to a galvanised, 3CR12 or Stainless Steel. 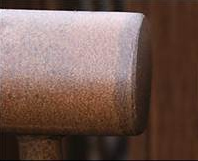 Common issues related to Powder Coating as well as the corrosion levels of the country. Believe it or not, the Highveld’s environment is just as corrosive as some coastal areas. Powder coating is still one of the most cost-effective coatings available as well as the most aesthetically pleasing, the key is knowing how corrosive the environment is and ensuring that the correct mix of components is applied. If you have any questions or doubts regarding your current or future products please contact us for further information. 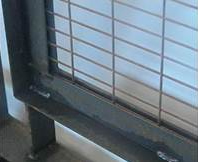 The railing shown was not welded on the top of the upright. Although we have applied over 200 microns of paint in this area in order to fill the gap, we have not been totally successful. Water will flood and remain in the dark areas shown, and because there is no paint will rust quickly. On design and manufacture, all water traps should be avoided. This job could have been hot-dip galvanized; the zinc would have filled the cavity. Rust was beginning to show. 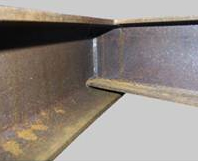 Two problems, generated by the desire to have a smooth finish; the material was not galvanized which is advisable when requiring white, as a pinhead of rust will leave large brown stains on a contrasting background. The second problem was the use of bright steel, which has sharp edges. It can be seen that only these edges are failing, not the flat areas. The mesh has been trapped between the inside flat of an angle iron and a strap. This has presented us with two problems. We cannot get paint between the two flats and around the mesh, and a water trap has been generated. Water will collect in these areas and without any paint will definitely rust, in a matter of weeks. We would expect brown rust marks to run over the fresh paint. Shortly after the paint will begin to lift as the rust will creep underneath. 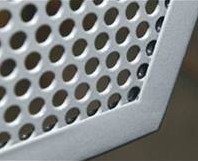 This is a popular design for fixing perforated sheet. However, it is a very bad design for avoiding corrosion. The visible area of perforated sheet will be well protected; however the inner face of the folded edging will start to go rusty in a matter of weeks. On close observation, it can be seen that it is not painted. This is because there is no practical way of getting the paint in there, leaving it with no protection. To compound the problem, water will fill the bottom edge. Within a year, this may need replacing. If this is an obligatory design, stainless steel should be used with drain holes. Once painted introduce oil, or wax oil, this will help protect the un-painted areas. It is important to consider corrosion protection during the design stage. Where there is no paint there will be no protection. This area of overlap could have easily been remedied by using the same size channel or removing the bottom web and fully welding. 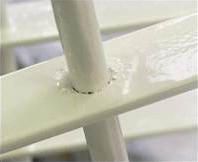 All painting systems whether it be wet paint or powder coating are more vulnerable on sharp edges because at these points it is usually a thinner coat. 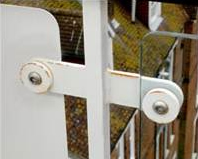 On the picture the fabricator has removed the sharp edges on the end of this balcony. A large radius is not required as long as the paint film is uniform thickness, which is not possible on a knife-edge. 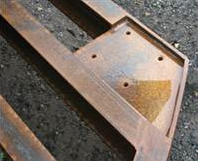 As with the picture above, if it is wet, it is more vulnerable to corrosion. This balcony platform has been manufactured with a water trap. It will stay wet for most of its life. To make matters worse it will have a square foot plate from a post bolted on to it. This will mean the water will be sandwiched between two plates. A bad situation for a structural fixing. Place a layer of sealant between the two surfaces after painting. Thick grease will last many years repelling the water.